When a group of home builders in Morris, Man. split four bottles of whisky before hiding a bottle of loganberry wine in a wall, they hoped someone would find it in time to split it with them — that was on March 4, 1966. Now, Amber Herkert and her husband, Jason, are the proud owners of a 53-year-old bottle of loganberry wine and a letter signed by nine tipsy tradespeople. The couple made the discovery Thursday night while renovating their bathroom. “My husband was starting to take out all the tile and drywall and everything in our bathroom,” Amber Herkert told CBC News. 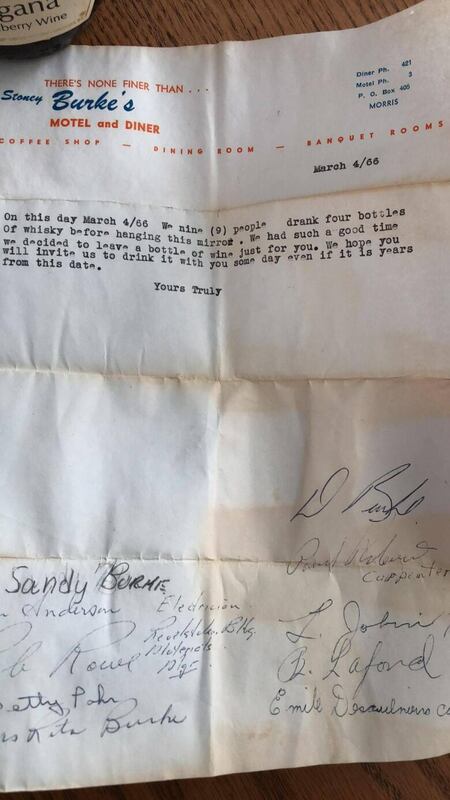 The letter is short but makes clear how many people took part in the four bottles of whisky. The writers let the future finder know why they left the bottle to age in its drywall cellar and what to do when they found it. “We had such a good time we decided to leave a bottle of wine just for you,” the letter says. The couple haven’t been able to track down any of the people who signed the letter, but the son of one of the carpenters lives down the road. They’ve reached out and are giving him a copy of the letter. Even if the couple does manage to find the builders and cheers them to a job well done, Herkert says they’re not sure it would be the healthiest idea to try the 53-year-old wine. “We’re a little iffy on that,” Herkert said. So, the original letter, Herkert said, is going back in the wall along with the bottle, which is still full, and a new note that the couple has yet to write.